Kit's Coty House, the remains of a megalithic dolmen burial chamber, is part of the Medway Megaliths, which I visited this month for the first time, with some friends. 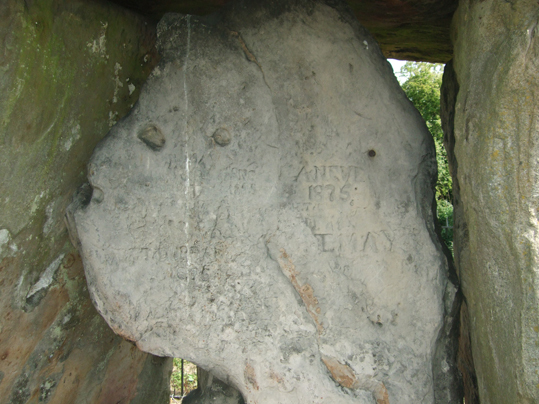 Kit's Coty House is less than 10 miles from Coldrum Long Barrow, which I blogged about on Friday. Actually, Kit's Coty House is one of a pair of Neolithic burial sites that are very close to each other. The second is called Little Kit's Coty - I'll be blogging about that tomorrow. The huge, iconic, sarsen stones that make up Kit's Coty House are very impressive and are a famous Kent landmark. They are in a pleasant meadow of wild flowers that offers lovely views over the North Downs and Medway Valley, but I didn't feel the site had as much atmosphere - or magical energy - as Coldrum Long Barrow. Perhaps that's because the stones are tightly enclosed in Victorian iron railings and you can't touch them. I guess the railing are there because those pesky Victorians started carving their names in them (see photo below). Obviously, no one should damage ancient sites. Kit's Coty House, despite being a famous landmark, is pretty hard to find. The site is managed by English Heritage and the directions on the EH website got us to where we thought the stones ought to be, but at first we couldn't find them. Even after asking in a nearby pub for directions we wandered around for ages without success. One of my friends then managed to get enough signal on his phone to look at the Megalithic Portal website, which had a more detailed map. After that, we spotted a sign hidden in bushes pointing to a promising footpath, which eventually led us where we wanted to go. 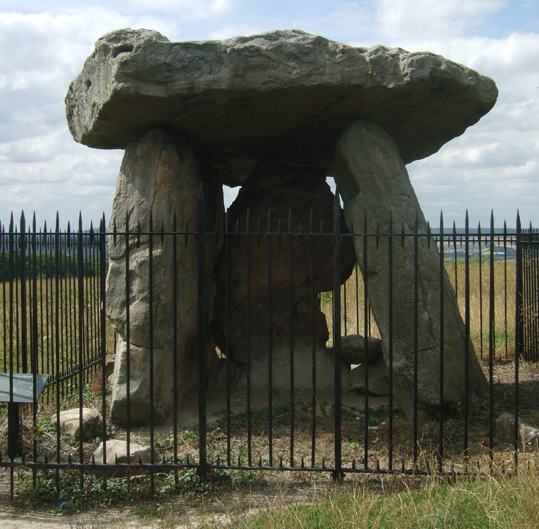 Late summer is a great time to visit Kit's Coty and the other Medway Megaliths, but I think it would be impressive at any time of year, despite the railings.